The Panera Bread fast casual restaurants were conceptualized to be bakery-centric and bread-focused. The original Panera Bread Mission statement had an extremely narrow focus on one product offering—bread. In fact, Panera Bread is one of the U.S. restaurant chains credited as being the driving force behind the artisanal bread craze in the U.S. Along with the expansion of the Panera Bread restaurant chain has come an expansion of the Panera Bread mission. It's not that Panera is abandoning its original all-about-the-bread mission. It's just that the leaders have realized that unless you are a retail bread shop, other aspects of your restaurant business deserve attention as well. Still, anybody who knows anything about Panera Bread and its history knows that the restaurant menu and the ingredients behind it were, and still are, a high priority. Some 20 years later, Panera has created an official corporate mission document which is again focused on the food. But this time, Panera's "Food Mission" statement provides both philosophical guidance and practical guidelines for sourcing, using and serving the food as well. This "Food Policy" was made "official" on June 3, 2014. 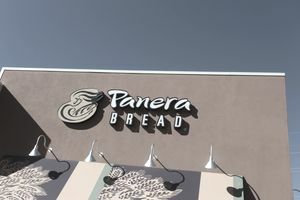 The Panera Food Policy was then published and made publicly available on the PaneraBread.com website so that customer would know the company's overarching philosophy about the food it serves and the commitments that guide the company's choices with ingredients and menu items served in Panera restaurants every day. Key Points in Panera Bread's "Food Policy"
"Clean Ingredients: We’re committed to sourcing and serving high-quality ingredients without artificial additives including added MSG, artificial trans fats, and ingredients we don’t believe need to be in your food. Transparent Menu: We’re committed to transparency to empower guests to choose how they want to eat. Positive Impact: We believe guests deserve to know not only what is in their food, but where it comes from and how companies are impacting the food system." The Panera Bread restaurant chain actually had two founders. Louis Kane was the founder of the Au Bon Pain restaurant concept. Ron Shaich was the person who bought Au Bon Pain from Louis Kane and transformed it into the Panera Bread concept. The influence of both founders can be found in the Panera Bread mission statement today. Ronald M. Shaich was born on December 30, 1953, in Boston, Massachusetts. His father was a public accountant and his mother an education specialist. When Shaich was growing up in Livingston, New Jersey he had no interest in getting into business. Instead, he wanted to get into politics or government. His first job was helping out with political campaigns in high school. Shaich plans were to study law and to work in the legal system. But one day he was in a convenience store near the campus with some friends and the entire group got thrown out of the store. The owner accused them of shoplifting, but Shaich believed the owner just didn't want to do business with students. That day Shaich and his friends got the idea to open and run an on-campus store for students. The store was funded by students at $20-$30 per student and despite hesitation from the school, Shaich made his store for students a success. This retail venture and Shaich's success with it revealed his passion for business in general and retail in particular. After graduating from Clark University, Shaich's newly sparked business passion motivated him to attend Harvard Business School. After graduating from Harvard with a Master's Degree in Business Administration, Shaich went to work for a small retail chain of cookie stores called the Original Cookie Co., which eventually merged with the Mrs. Fields chain. While working at the Original Cookie Co., Shaich got the idea for a chain of urban cookie stores. It was not long after that when, at age 27, Shaich founded his first retail enterprise which he called The Cookie Jar. The store was small and Shaich soon found himself wanting more. The "more" that he got changed the course of his career. He became a licensee for Au Bon Pain and sold croissants at the Cookie Jar. When Shaich added bread making to his company it sparked a desire for expansion. The Au Bon Pain chain bakery chain was owned at that time by Louis Kane. It was heavily in debt and at risk of going bankrupt, so Shaich bought it out. After growing the Au Bon Pain chain to 225 stores, Shaich ended up selling off the Au Bon Pain namesake stores to focus on some units with a different focus that had been named St. Louis Bread Co. The concept developed in those St. Louis Bread Co. stores were the precursor to the impressively successful Panera Bread chain. When Shaich bought out Au Bon Pain he and the Au Bon Pain founder, Louis Kane, became partners. Kane and his wife Katharine led active, involved, and philanthropic lives filled with a variety of interests. Kane was a cook and a skier before he founded Au Bon Pain and Katharine worked in politics, founded community organizations, and attended Harvard Divinity School at the age of 60. Because of Kane's natural sense of adventure, he didn't hesitate to marry Katharine even though she was Protestant and he was Jewish, which was not a generally accepted pairing in the 1950s. It was that same sense of adventure that led him to found Au Bon Pain, a restaurant chain centered around croissants in the Midwest United States, which eventually was the springboard from which Panera Bread was launched.